The Museo de Arte Abstracto Español in Cuenca exhibits a permanent collection of 129 paintings and sculptures by Spanish artists of the Abstract Generation of the 1950s and 60s (Millares, Tàpies, Sempere, Torner, Rueda, Zóbel, Saura, among some thirty other artists), as well as other artists from the 1980s and 90s. In 1980, the founder of the Museum, Fernando Zóbel, donated its collection to the Fundación Juan March, which then incorporated it into its own collection. 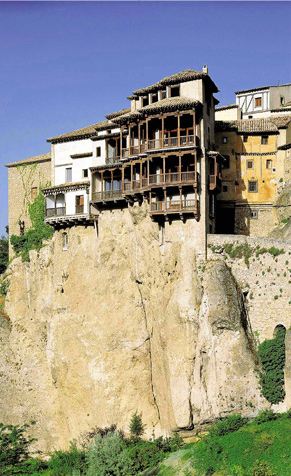 Situated in the Casas Colgadas (Hanging Houses) of the city of Cuenca, in a late-fifteenth-century medieval building, property of the city, the Museum has undergone various renovations and, in 1994, inaugurated its galleries for temporary exhibitions. In the Museum Shop visitors can purchase editions of its catalogues, books, graphic works, and postcards. The Museum administers an educational program for pre-school, elementary, and junior-high-school students. In 1980, the Museum received the Medal of Honor for Merit in the Fine Arts; in 1981, it was given the European Museum of the Year Award by the European Council; in 1991 the Medal of Honor from Castilla-La Mancha; and in 1997, the “Tourism” Award from Castilla-La Mancha.